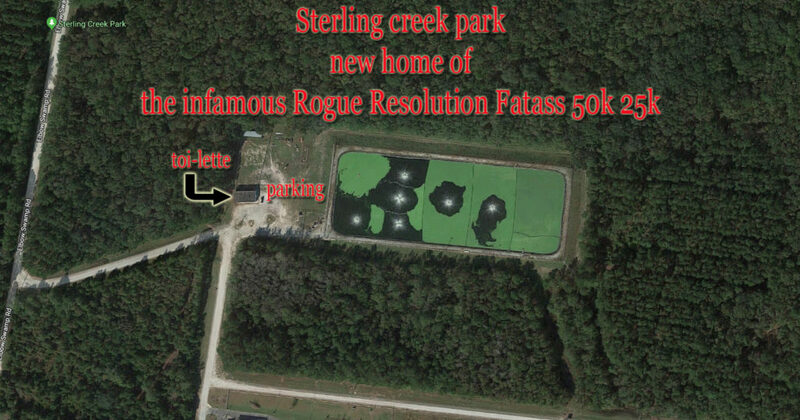 The Rogue Resolution Fattass 50k 25k has moved locations from the Roberd’s Dairy Farm to Sterling Creek Park in Richmond Hill! This year we are charging $5 a head so that we can have a little spare change for some custom home made awards and a nice-sized check for Rogue Rescue. Even though we’re charging five dollars a head we still ask folks to bring some edibles (human consumption grade) and a little change for the donation jar. aside from using a little bit of the money for the awards and race bibs the rest of the money will go to rogue rescue. The course is 3 miles long. So, 10 loops and some change for the 50k and 5 loops and some change for the 25k. The two RD’s (Jason and Dan) will be running with you all. So, we will have a whiteboard for you to mark your laps by your name and of course, the good old garmin system! If you’re laps indicate you ran 50k but your garmin indicates that you ran a 5k we may be a bit suspicious and raise eyebrows at you. So be honest and awesome. Your race bibs will be made of cloth fabric. On your last lap hang your race bib on the rope provided (if you want to). We will hang all of the race bibs that are left on the rope at the dairy farm’s Gypsy’s trail where all of the prayer flags are at…its a tradition.